Can you please explain "reduction" and the difference between a "reduced" wine and a wine that is "closed" or "shut down"? Let me tackle these terms one at a time so everyone can follow along …. There’s a style of winemaking referred to as “reductive,” when a winemaker takes steps to limit the amount of oxygen that wine is exposed to, either with sealed containers or inert gases, typically to preserve fruit flavors, colors and vibrancy or concentration. On the other side of the spectrum is “oxidative,” where wine is encouraged to mingle with oxygen, often with structure, texture or long-term stability in mind. Not all wines are made with an either/or approach—a winemaking process might include oxidative techniques during fermentation and more reductive techniques over the course of élevage. Each method has its pros and cons, and one of the potential pitfalls of reductive winemaking can be "reduction," or a wine that is "reduced." Reduction is pretty easy to pick out—reduced wines can be, for lack of a better term, stinky. Reduction is marked by volatile sulfur compounds, or mercaptans, that emit unpleasant, skunky aromas of rubber, sulfur or garlic. They remind me of the smell of a struck match or rotten eggs. Sounds appealing, right? The good news is that reduced wines are not harmful to drink, and those off aromas may dissipate, or "blow off," after exposure to air through decanting or swirling the wine in the glass. Now on to a wine that is “closed,” “shut down” or "dumb." This is harder to describe, because it refers to what is (hopefully) a temporary situation. A closed wine is one that might be expected to show a certain way but is instead inexpressive, austere, disjointed or awkward. Flavors might be muted, and the tannins and acid might stick out. This is an anecdotal phenomenon, and the best way I can explain it is that all of the stuff in wine—phenolics, tannins, compounds and such—are constantly evolving, both on their own and in relation to each other. Sometimes they temporarily fall out of harmony. 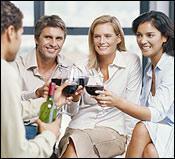 A reduced wine might only be stinky for a moment until you introduce oxygen by swirling or decanting. A closed wine might show strangely for a few months before bouncing back to its potential. But once a wine is oxidized, there’s no turning back.